Fanny's Favorite is a skill builder for working with the triangle shapes attached to a square -- as shown in each corner of the quilt block. 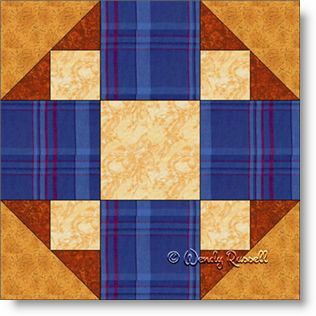 This is an easy nine patch block to create, as most pieces are large but the overall effect can be quite dramatic in a finished quilt. The sample quilts illustrated show how different your quilt can be by simply deciding on a straight set for the blocks or putting them on point. It's time to let your imagination loose now. See also Fanny's Favorite - a Variation for a more challenging version of this quilt block.